What influence will green jobs have on worker safety and health, the safety professional, and personal protective equipment? Safety experts say worker safety should be integrated into sustainability projects to avoid unintended consequences. A strong safety culture is needed to facilitate the safety professional’s contribution to each level of a design process. Signs of how the green movement will affect trends in the design of personal protective equipment remain to be seen, but the demand and need for specific PPE for green jobs is increasing. Whether it was caused by the shift in consciousness about the effects of global warming or the push for economic recovery, there is no denying the “green” movement is here and growing. However, keeping up with the fast pace of the green revolution could be a challenge for the safety professional. In January, Secretary of Labor Hilda L. Solis announced nearly $190 million in funding for green job training grants, as authorized by the American Recovery and Reinvestment Act of 2009. California has invested millions of dollars into clean energy job training programs to prepare workers for tasks such as installing solar panels and maintaining electric vehicles. A number of other states also have set new renewable energy goals and are offering tax incentives to help organizations reach these goals. In 2008, the wind energy turbine industry added 35,000 new jobs, according to the Washington-based American Wind Energy Association. The Bureau of Labor Statistics broadly defines green jobs as jobs involved in economic activities that help protect or restore the environment or conserve natural resources. Supporters of green initiatives say the renewed interest in environmental sustainability has led to more jobs and could lead to more positive outcomes, such as energy savings and greater job satisfaction. The downside, safety experts contend, is that when it comes to green jobs, workers still face traditional and emerging hazards. The bottom line: Green does not necessarily mean safe. OSHA administrator David Michaels has warned that “employers who rush into the green economy without paying attention to worker safety and health will blunder into many preventable injuries and deaths,” and promised OSHA would look carefully at worker safety and health issues related to green jobs. The agency created a website to examine industry-specific hazards, outline OSHA standards applicable to the hazards, provide resources for addressing the hazards, track accident information, and offer outside resources. In March, BLS announced it will collect labor data on green jobs. Matt Gillen, construction program coordinator for NIOSH, said the concern is that there seems to be a “blind spot” for occupational safety and health among organizations pursuing renewable energy. Safety and health is not integrated into sustainability projects, which can lead to unintended consequences, he said. One emerging issue of particular interest is green construction. Last year, green building – which can involve electric power generation, water treatment systems and waste management – provided 2 million jobs, according to a report by Chicago-based consulting firm Booz Allen Hamilton. Researchers also estimated that from 2009 to 2013, green construction will provide more than 7.9 million jobs, with 230,000 being newly created or saved jobs. LEED rating system, while mention of ensuring worker health is limited. 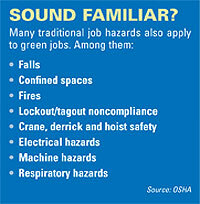 OSHA has responded by tasking a work group with exploring the elements of green jobs. The work group met to discuss the assignment in April. Employer representative member Dan Zarletti, vice president of safety for Kenny Construction Co. in Northbrook, IL, said efforts to correct and include worker safety guidance in the design stage of the “green initiative” is like “trying to put toothpaste back in the tube.” Zarletti later told Safety+Health magazine that the work group discussed how nothing was designed into the process that would ensure safety was maintained at high levels as the nation goes green. “The safety training element was not even included,” he said. In July, the work group met again to discuss LEED’s ranking system and the possibility of creating a similar sustainable construction safety and health rating system for workers, Gillen said. Dis- cussion included consideration of alternative materials that are safe for workers, such as addressing potential fall risks for workers who install skylights. BLS data shows that in 2001, 23 workers died from falls through skylights. Michelle Myers, manager of labor, health and safety policy for the American Wind Energy Asso- ciation, said the wind industry has no single source for best practices or guidance documents on safety practices, but AWEA is in the process of developing various products and materials, and plans to introduce programs in October. Various safety training, regulations and programs will be integrated into the program, she said. In addition, each company within the wind industry has developed its own safety programs. “The industry is now developing basic standard expectations and reaching consensus on many of these areas to ensure the best in regards to worker safety and health for the industry,” she said, adding AWEA is working with OSHA to develop comprehensive programs, educational opportunities for OSHA and training programs. John Czerniak, former senior consultant for the National Safety Council, said the rapid pace of the green movement has created a need for more hazard recognition, evaluation and control. He said safety professionals are faced with addressing the potential conflict between safety and economic viability in a newly developing industry. Issues that arise as new companies rush for green job funding include the risk for more untrained workers and smaller businesses not having enough resources, Czerniak said. “The question becomes: How is the safety professional integrating safety with design?” he said. Safety professionals should know that no matter what kind of job or industry, hazard prevention can be maintained by traditional and systematic hazard control measures. Small and new businesses also need to avoid skimping on safety and recognize there is a greater cost for ignoring safeguards and retrofitting for safety, he said. Michele Schroeder, head of Environmental Risk Management, Environmental and Solutions for Zurich North America Commercial, said safety professionals should prepare to be a resource for organizations that are attempting to adhere to new emissions standards and other environmental regulations. They need to be vigilant about what regulations emerge and what environmental risks create liability, she said. (In 2008, Schaumburg, IL-based Zurich created a Climate Change Office.) Risk managers should be asking questions about their company’s environmental liability and their preparedness for environmental claims, she said. There has been a shift from traditional claims for the cleanup of soil and groundwater arising from business operations and property ownership and control to include claims for diminution in property value, medical monitoring and loss of property, Schroeder said. Some safety experts say it is too early to tell what personal protective equipment trends will emerge from the “green revolution,” but others are seeing more interest from certain industries. A number of manufacturers have jumped on the green bandwagon by stepping up the marketing of environmentally friendly products. Mike Casbon, chairman of the Doylestown, PA-based National Demolition Association’s safety committee, said PPE will play a bigger role in protecting workers in his industry, as they do more handling of materials while working on assembly lines to sort through reusable materials that remain on a site after demolition. But the biggest issue demolition industry workers face right now is health hazards from lead paint. Additional health risks come from exposure to polychlorinated biphenyls, hexavalent chromium and asbestos, according to OSHA. Casbon warned safety professionals to avoid giving workers PPE without accompanying training, and instead to place more emphasis on education about hazard awareness. Over the past few years, a greater focus on PPE for firefighters has been placed on improvements in thermal resistance. But today’s firefighters also face exposure to different building materials and more heavy metals. As a result, interest is growing in trying to clarify the effects on PPE in terms of contamination and exposure to hazardous materials, said Casey Grant, program director of the Fire Protection Research Foundation of the Quincy, MA-based National Fire Protection Association. Dale Pelletier, president and CEO of Colorado Springs, CO-based Woodland Workwear LLC, said his business has experienced growth due to a number of unsolicited calls from wind energy professionals who are interested in the company’s work pants, which incorporate built-in, orthopedic gel knee pads. Workers in the wind energy industry face fall risks and some traditional knee pads could become a hazard when workers are 300 feet in the air working in a turbine, he said. Pelletier said organizations with a high fall risk are looking for PPE that does not create new hazards for workers while on the job and is made of material that can withstand extreme conditions. Because many green jobs require working from great heights, dropped item prevention is a rising fall protection trend that extends far beyond the traditional harness and anchor point for workers, according to Thomas Votel, president and CEO of St. Paul, MN-based Ergodyne. “Preventing items from falling is a top safety concern for green job employers because a falling wrench or 1-inch bolt can cause serious damage in a matter of milliseconds,” he said. Ergodyne recommends that any equipment a worker uses be tethered, topped and tagged with a weight rating. All tools and equipment need to be secured with a tool lanyard to prevent items from falling, Votel said. Other PPE needs related to green job workers at height include high-visibility apparel, hand protection and knee protection. A concept that continues to influence PPE design is the need to be productive while managing moisture, temperature and other environmental factors, he said. Tom Broderick, executive director of the Construction Safety Council in Hillside, IL, said the frustrating thing about the green movement is that funding for green jobs and training is not necessarily going toward safety training, PPE or making sure workers are aware of their rights under the laws to have a safe workplace. Studies have shown that serious injuries often occur to people on the first or second day of employment. Latino construction worker and day laborer fatalities are considerably higher than for their Anglo-American counterparts, he said. “There are still people getting killed in the ‘old-fashioned way’ – from falling, becoming electrocuted, being struck by objects, or being caught in trenches that are collapsing or getting caught in machinery,” Broderick said. He advised safety professionals to look to the classic principles of providing a safe workplace.